So Which Class Should Prosports Race In? We became aware a week ago that a row was brewing regarding the two Prosports that were due to race at Donington Park last weekend, in the Avon Tyres British GT Championship, and have since reported the ruling that was made on Wednesday of this week (May 24) – that the two cars have been switched to the GT2 Class. In the interests of fairness and accurate reporting, the most reasonable way to cover this controversy is to list the sequence of events. So, as far as we are aware, the sequence reads like this. Robin Mortimer, father of RPM racer Alex Mortimer, prepared a letter in advance of Donington Park, with the aim of securing the support of all the other GTC entrants in the championship, to “seek the removal of the Tipo Prosport 3000 from this years championship”. The letter goes on to suggest that any Prosports racing at Donington Park’s two hour race should “be removed from all results”. The letter continues by justifying why the cars – those of Ian Stinton and Simon Scuffham – should be removed from the championship. 1. The car was designed as a “sports prototype sportscar” and it was apparently never intended by the manufacturer that the model should be produced as a road car – and the factory never apparently produced a road version of the car. 2. “The minimum production run of 250 cars to homologate the car for road use was never undertaken” and the car “does not have any homologation papers”. This third point then goes on to suggest that a Prosport lapped the International Circuit at Silverstone in 1:18.605 – a time which, for comparison, would have placed this Prosport at the tail end of the GT1 grid at the 2005 FIA GT event at that circuit. However, we (at dsc) have been convinced that the 1:18.605 was not in fact set by a Prosport, in any form (GTC spec. or otherwise). Owing to a switch of cars by the car’s (cars’) owner, this time was in fact set by an LMP2 car. The best GT2 time at the 2006 British GT media day was a 1:25.07 and the best GTC time was a 1:27.30 (on Avons). “The same performance advantages will be enjoyed (by Prosport entries) at any and every circuit competed at in (if) driven competently”, concludes Mr. Mortimer’s point 3. The letter was circulated among GTC entrants, and others, at Donington Park, and out of 14 GTC teams, at least three, perhaps as many as five, we believe, refused to sign the document. The two Prosports competed in the race, Simon Scuffham’s finishing 18th, after being removed from the gravel on lap 1, Ian Stinton’s failing to finish. The implication, in point 4, is that neither Prosport is being driven ‘at the limit’ (“to its performance parameters”) – which would certainly be the case if either car could lap Silverstone in 1:18.605. But that was a completely different type of car (an LMP2). Simon Pullan, a driver of known ability, co-drove Ian Stinton’s car at Donington Park (having spotted the vacancy on dsc), and set a best lap of 1:23.079. Simon Scuffham’s car set a best lap of 1:22.194, which was the fastest GTC lap during the race. But can comparisons be made in one event, in wildly changing conditions? Ian Flux set a 1:19.646 in the Kevin Riley Mosler, but no one is suggesting that that car should be looked at. 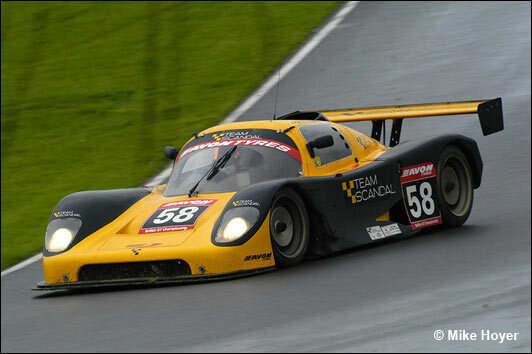 So is the Mosler 1.6 seconds quicker than a Ferrari 430? On that day, at that time, in those conditions, on those tyres, yes. A good, competitive grid, isn’t it? We’ve made the point already that the Prosports are very slow on the straights, because under the power to weight formula, these cars, which are very light, have relatively little power – so they make up their time in the corners, which is what one would expect of a light, low car. Isn’t it logical that a Prosport, such as Simon Scuffham’s, would be expected to perform well in the slippery conditions that prevailed in the race at Donington Park? And we can’t imagine Simon Pullan doing anything other than lapping as fast as he could – although in traffic, with very poor straightline speed, Pullan would have been hindered by other cars, wouldn’t he? We haven’t explored tyre choices made by any of the GTC runners in the changing conditions during the two hour race – that would make the whole issue too confusing, we believe. The Stinton / Pullan car was a retirement at the half way point of the race anyway. The SRO verdict was made public on May 24, and the Prosports were moved up to GT2, forthwith. “Following detailed discussions, the British GT Championship organisers SRO and the BRSCC have taken the decision that the Prosport LM3000 was incorrectly classified as a GTC class entry and will, with immediate effect, be reclassified as a GT2 class entry for the 2006 Avon Tyres British GT Championship” – says the statement. “Following a series of meetings, the decision was taken that the Prosport LM3000 was incorrectly placed in the GTC class and the two teams running these cars have been invited to take part in GT2 in the rest of the 2006 season,” stated Benjamin Franassovici, the British GT Championship Co-ordinator. “We had to make sure that this decision is the right one and we needed to gather the right amount of data to be sure that action had to be taken. That data can only be acquired by generating results on the track in a competitive environment." Simon Scuffham has now taken action to defend his position, and has made public a letter to Stephane Ratel. Scuffham has responded to each of the four points. 1. 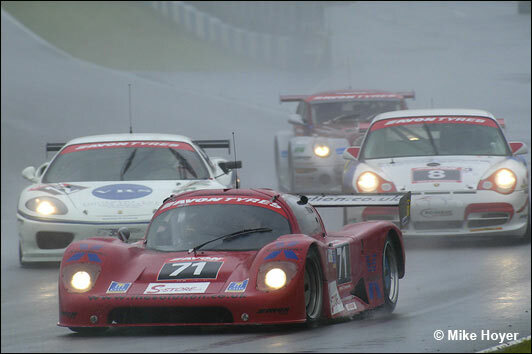 The basis of the (GTC) regulations are those of single make championships, in which the Prosport raced. The car has been accepted as a GTC entry in 2004 and 2005 (and at the start of 2006), in the British GT Championship. There are road-going Prosports: Ian Stinton actually owns one. 2. “Nowhere in the regulations does it demand any kind of homologation for GTC class cars”, is the entire response to point 2. 3. Scuffham contradicts the “evidence” in every case regarding the performance of “Prosports” at various circuits. Some of the times quoted in Robin Mortimer’s open letter were actually set by an LMP2 car, others by Michael Christopher’s Prosport, which was running in a different specification to a British GT Championship car. “To comply with the GTC power to weight regs, this car (Scuffham’s car) is now running an engine some 70 Bhp less than LM3000 specification (to achieve an at the wheels figure of 210 Bhp),” he says. Simon Scuffham has indicated that he has taken legal advice over this issue. Just one final point: one entrant who did sign the ‘Mortimer letter’ points out that the GTC Class is specifically for cars that were designed as road cars and have been made available for sale to road car buyers, and he firmly expresses the view that the Prosport didn’t / doesn’t meet this requirement. It was designed as a racing car. The power to weight rules do provide very evenly balanced lap times in GTC (see qualifying times, above), and the Prosports have been running in the class in 2004 and 2005. So there we are. No opinions being expressed here at dsc: we’re simply trying to present the facts.